Looking for ways to take your science lab or classroom up a notch? 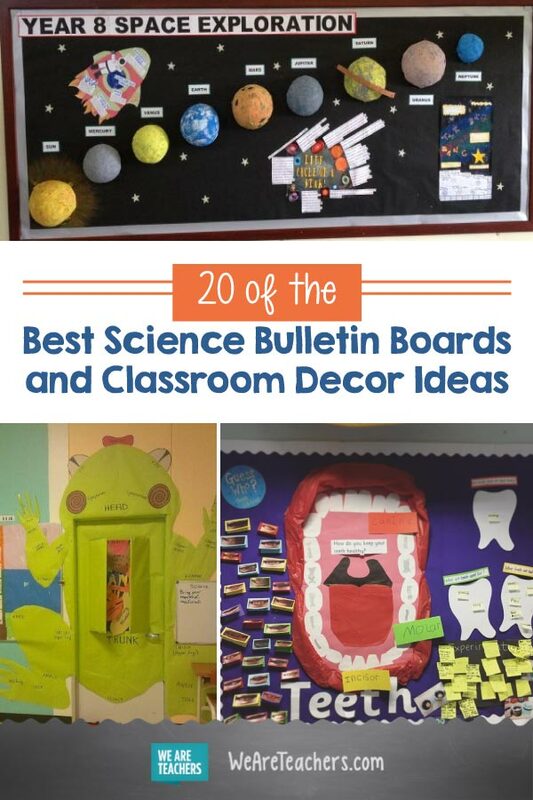 Look no further than these amazing science bulletin boards and classroom decor ideas! 1. Explore the solar system. It’s the 3D planets that really make this solar system board pop. Have students help create them from styrofoam balls or papier-mâché. 3. Teach the scientific method with memes. Make the scientific method come alive with memes! This is a fun way to help kids remember the steps of this all-important concept. 4. Put the periodic table on the ceiling. Chances are your classroom ceiling is covered with those ubiquitous ceiling tiles, so why not turn them into the periodic table? Teacher Dan Ruddy did it with die-cut vinyl appliques. 5. Map out cell biology. 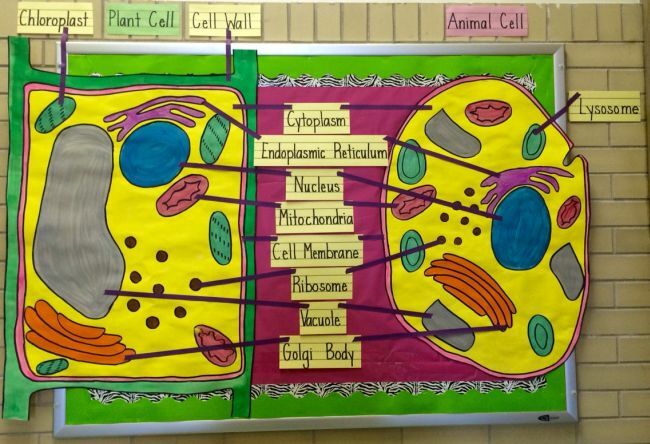 Bright colors and a simple concept make this cell biology board stand out. Comparing plant cells and animal cells side-by-side drives the learning home. 6. Chew on some dental facts. Open wide! The “guess who” shots of student smiles personalize this bulletin board and make science real for kids. 7. 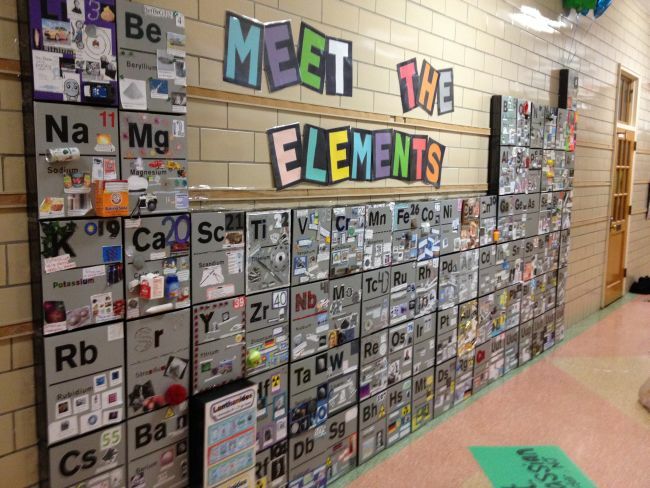 Bring the periodic table to life. The periodic table becomes much more meaningful when students find examples of the elements in the world around them. Have each student create a tile, then assemble them for an eye-catching display. 8. Become a mad scientist. 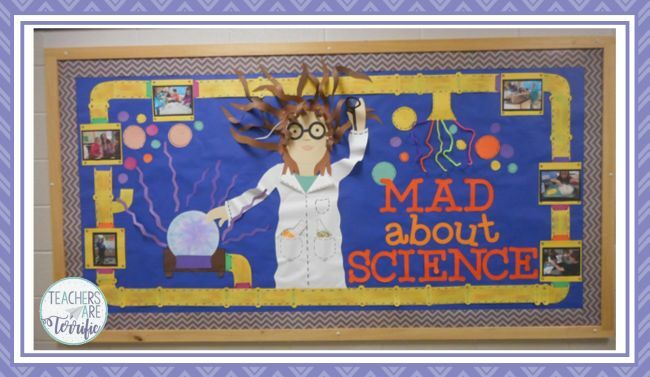 Mad science bulletin boards are popular, and we love this example where the teacher recreated herself in paper form! She added photos of her science classes in action as the year went on, too. 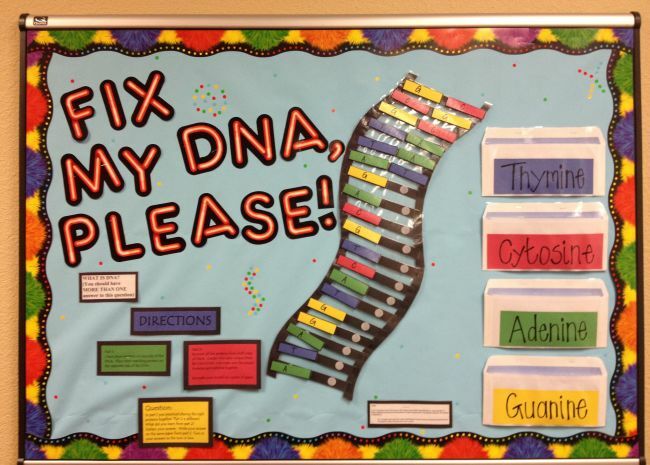 Use magnets or Velcro to create a build-your-own DNA strand. Challenge students to match up the pairs—they’ll get different results every time! 10. Celebrate the season with a chemistree. 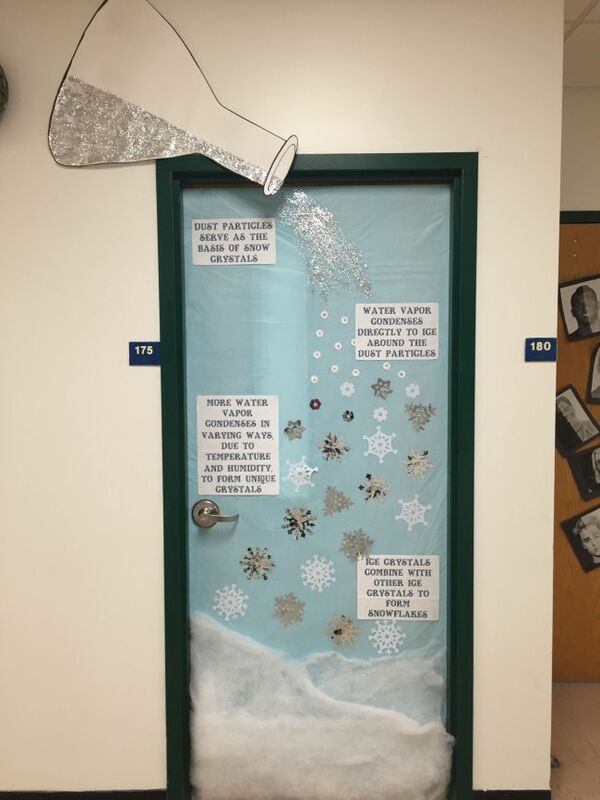 This science door decoration combines the holidays with some punny humor, so everybody wins! 11. Highlight current science news. 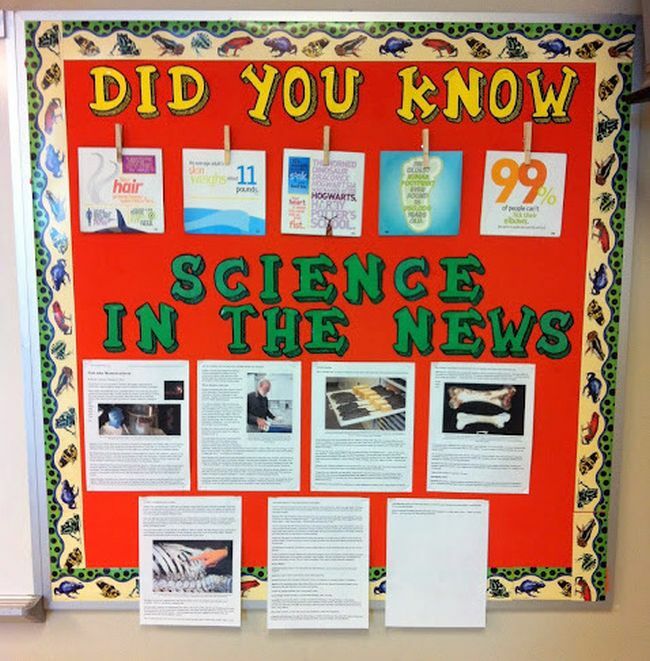 Keep kids up to date on new discoveries, scientific advances, and far-reaching exploration by posting news updates on your science bulletin boards. 12. Show off your science. 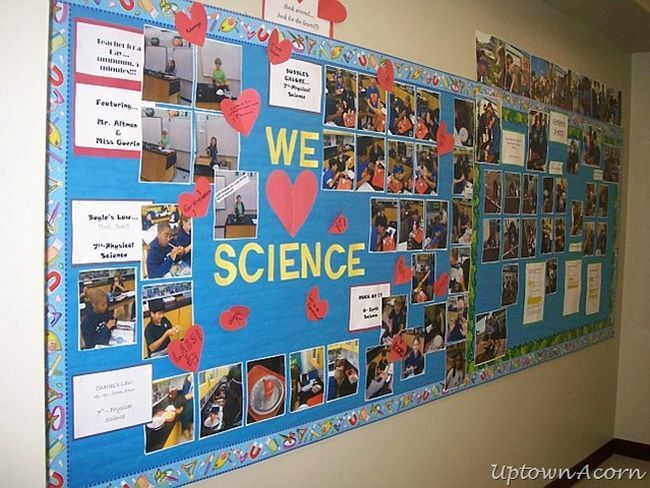 Fill your science bulletin boards with photos of your class projects and experiments. This will inspire future students and allow past classes to remember the fun they had while learning with you! 13. Dissect a giant (paper) frog. 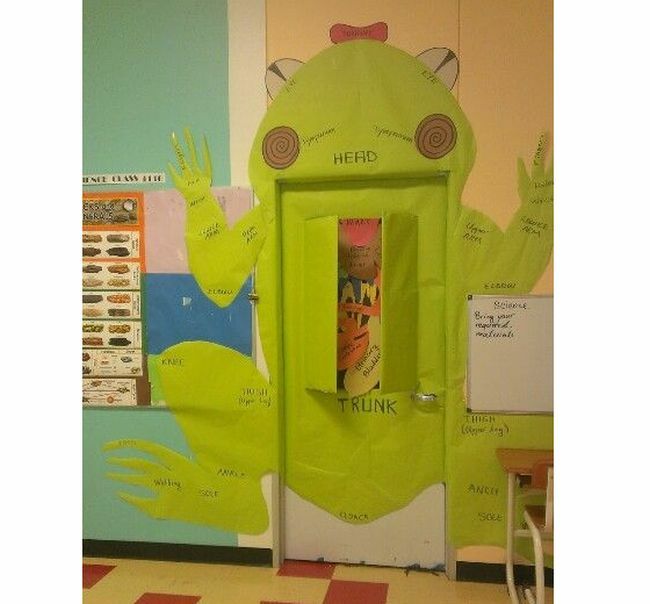 This interactive door decoration is making us green with envy! No need for formaldehyde—just lots of green paper and a bit of creativity. 14. Illustrate the path of human evolution. Simple silhouettes paint a picture of evolution that’s easy to understand. Cut them from black paper, or paint them on the wall if you’re allowed. 15. Show that science is everywhere. 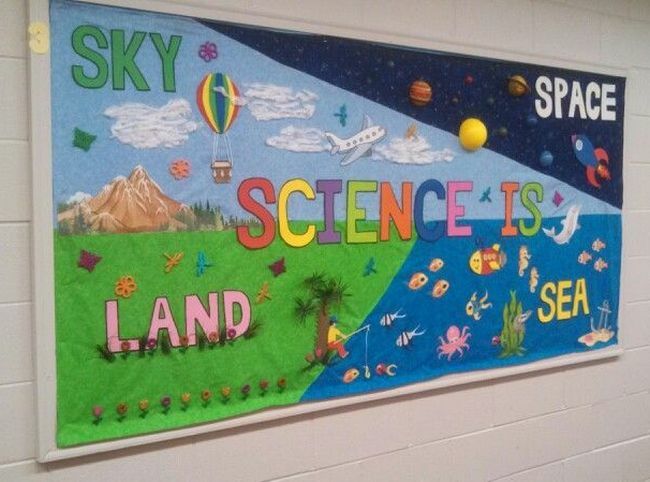 The detail, the 3D effects, the colors, the simplicity… everything about this bulletin board opens up the world of science for the students who see it. 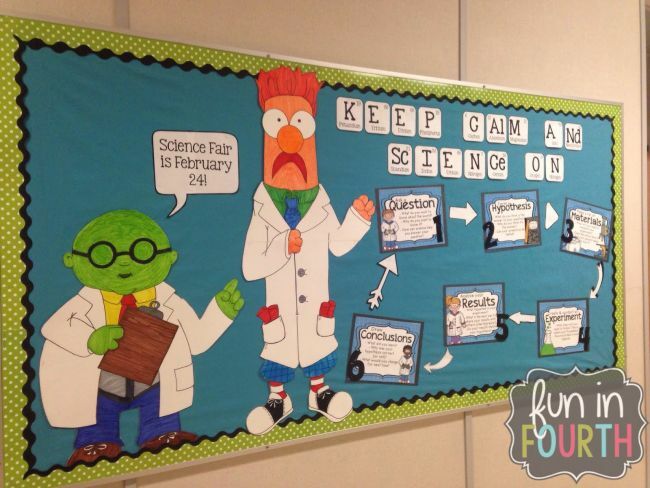 In our opinion, all science bulletin boards should feature Dr. Bunsen Honeydew and Beaker! They’ll make any science concept you display a lot more fun. 17. Tell time with the elements. 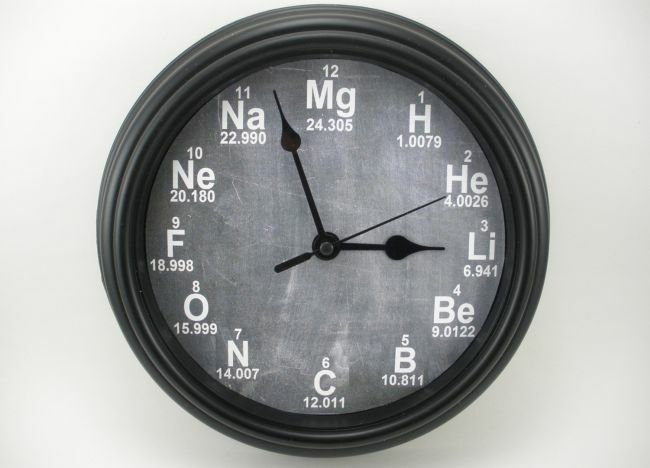 Your class will learn the first 12 elements of the periodic table in no time at all when they see them on your classroom clock! Make your own, or buy one at the Etsy link below. 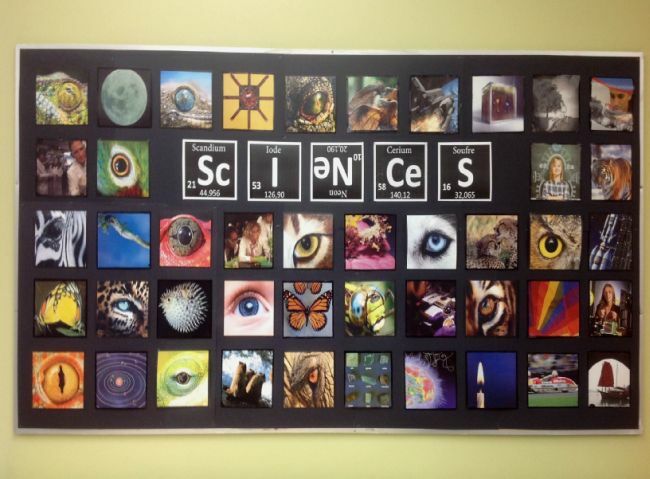 Ask students to take a photo of what science means to them, then print and display the images. Extra points for creative use of periodic table letters! 19. Post your burning questions. 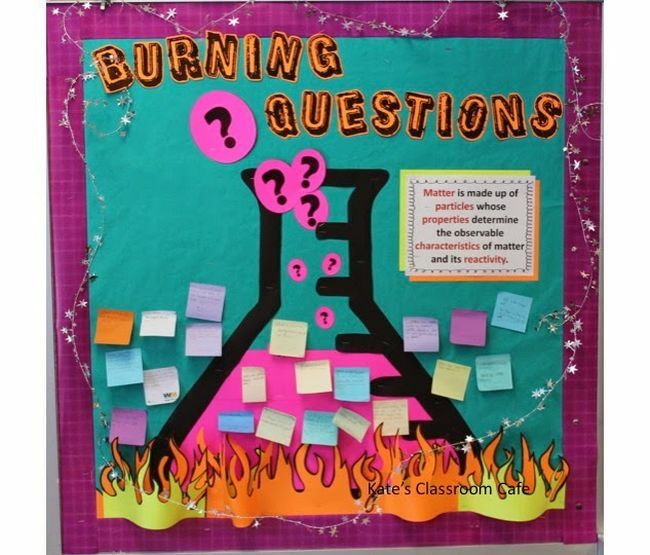 Use this fiery flask as a parking lot for student questions on your latest topic of discussion. You can change out the standard and clear off the questions as you move on. 20. Play a game of Operation. 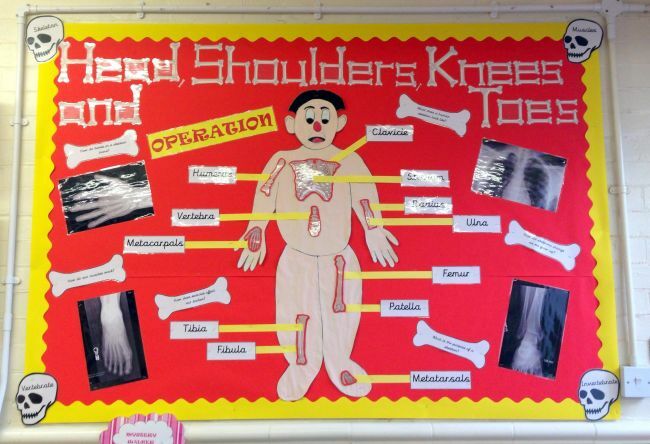 Your anatomy lessons will be a lot more entertaining when you add in the classic kid’s game Operation! Those x-ray images are just the icing on the cake. Speaking of anatomy, why not tickle your students’ funny bones with 20 Cheesy Science Jokes for the Classroom? Plus, check out our favorite experiments for 4th grade, 5th grade, 6th grade, 7th grade, and 8th grade.